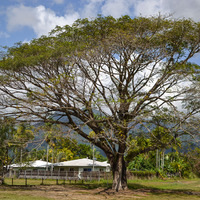 Originating in Central America, this shade, timber and forage tree is typically 15 to 20 m (50 to 65 ft) tall, though exceptional specimens may reach heights of up to 30 m (100 ft) or more. The branches start low on the trunk then spread out and up to form an umbrella-shaped crown. 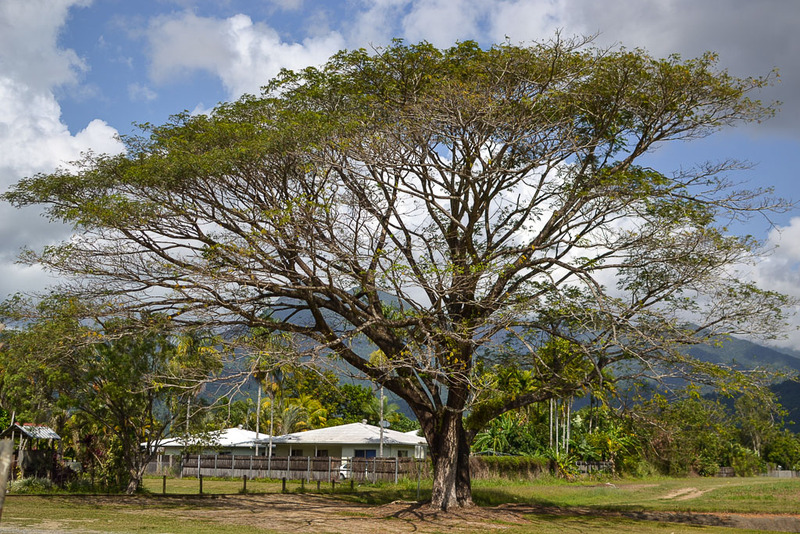 Where it has room to grow, it develops a massive, wide-spreading crown that is almost as wide as the tree is tall, supported by a stout trunk up to 2 m (6.5 ft) in diameter. The bark on mature trees is grey, rough and fissured. 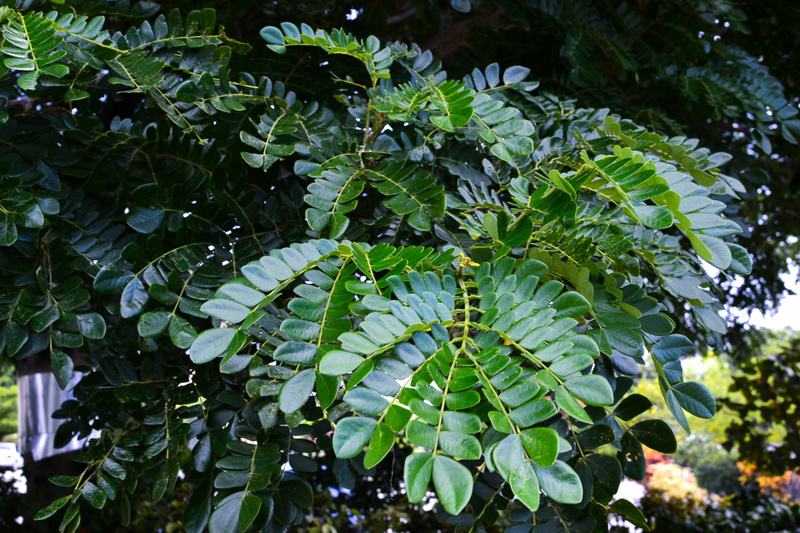 Leaves large and feathery, made up small green oblong leaflets that curiously fold closed at night to reduce transpiration, thereby conserving water. In the daytime, they open again for photosynthesis and in so doing help to shade the trunk and roots from the sun. 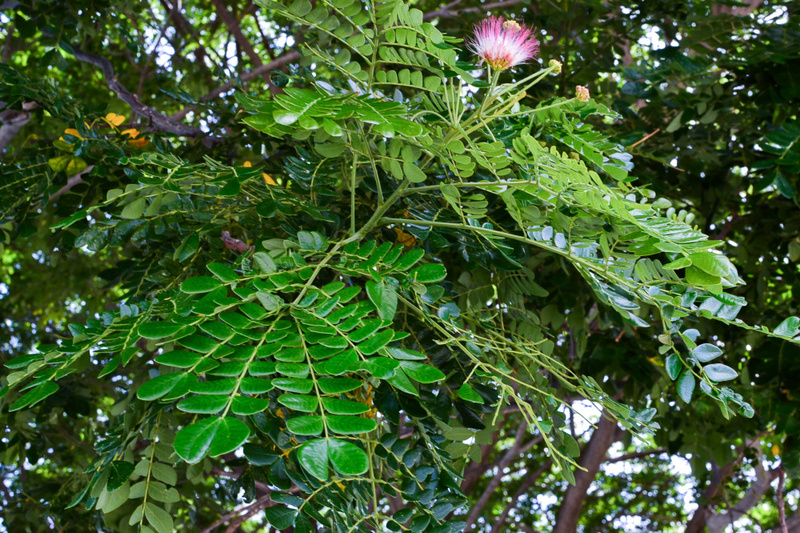 Most leaves and their leaflets are shed in the dry season to conserve water, leaving the branches partially bare until the new leaves emerge. 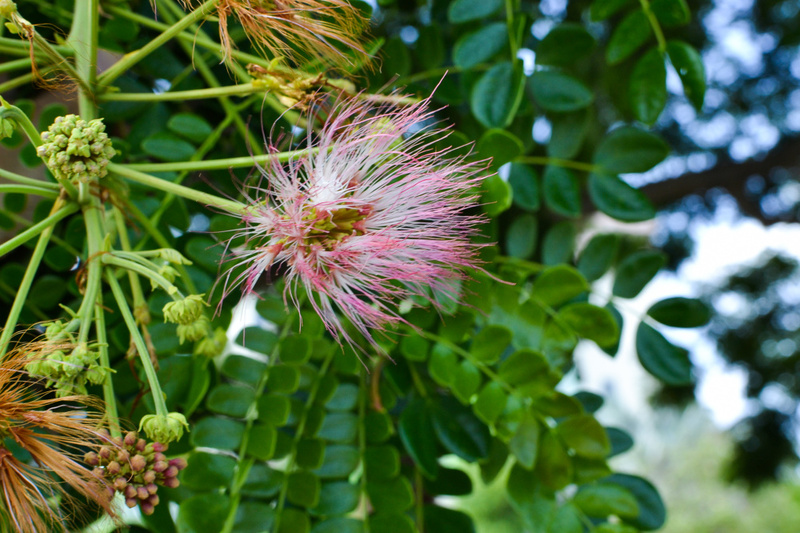 The flowers resemble powder-puffs with long pink-tipped filaments and are perfect, having both female and male parts. Flowering takes place in the dry season but varies by area, with almost continuous flowering reported in areas where there is no distinct dry season. 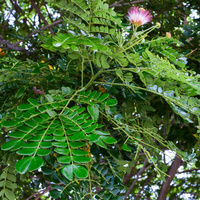 In Hawaii, trees usually flower from April to August and in tropical America and the Caribbean from January to April. Fertilised flowers are followed by slim, ribbed seedpods, 10 to 25 cm (4 to 10 in) long, green when young, becoming dark brown to near black when mature, at which time they detach and fall to the ground. Rain Tree produces a medium-weight wood in the 450 to 640 kgs per cubic meter (28 to 40 lbs per cubic ft) range, which puts it at the soft end of the hardwood scale. Reports on the wood's natural rot resistance vary, from moderately resistant to resistant. It would appear rot resistance can be explained, at least in part, by tree growth rates, with slow-growing trees producing wood with a higher rot resistance than fast-growing trees. Growth rates in tropical trees is strongly influenced by moisture, with growth rates usually much slower in low rainfall areas. The heartwood is an attractive reddish-brown and the logs, when available, are sawn into planks used for interior joinery, millwork and for making fine furniture and cabinets. Large free-form tabletops are sometimes shaped from cross-cut slabs taken from the massive trunk. Selected roundwood lengths are sliced for decorative veneer or are carved into bowls and other woodcraft items. Wood from slow-growing trees tends to have low shrinkage, allowing carvings and other woodwork to be done using the green wood, which can then be dried with minimal to no cracking or splitting. 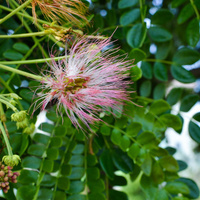 It is a common tree in tropical pastures, where it serves as a shade tree for livestock and to provide supplemental feed during the dry season, by way of its seedpods. The mature seedpods are relied upon, particularly in the time between the end of the dry season and after the first rains, before there is sufficient grass to support grazing. During this time, the seedpods fall to the ground in great numbers where they are eagerly browsed by cattle and other ruminant livestock. 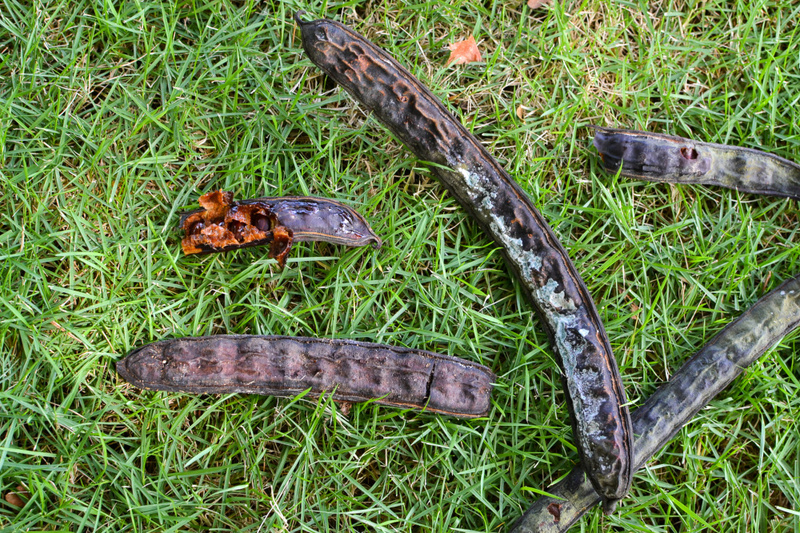 The seedpods are made palatable to livestock by thin layers of a sweet, sticky molasses-like substance in their shell and have a crude protein content of between 13% and 18% of their dry weight. The new leaves are also highly palatable, with a crude protein content of between 20% and 30% of their dry weight, but are not usually within the reach of browsing livestock. The bark, on wounding, exudes a dark gum partially soluble in water, swelling to a tough cartilage-like mass. It was reportedly sold at one time in the Mumbai markets but its use remains unclear. 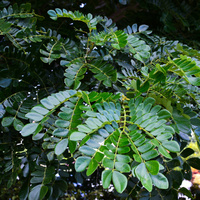 It is a commonly planted amenity tree in parks, parking lots and along roadsides in urban areas, mainly for the shade it gives. Grows naturally and has its best development in sub-humid to humid tropical lowland climates, generally in areas with annual lows of 17 to 25 °C, annual highs of 27 to 35 °C, annual rainfall of 700 to 3500 mm and a dry season of 6 months or less. New plants are usually raised from seed which remain viable for several years under cold, dry storage conditions and germinate readily when sown. Performs best on free-draining clay-loam, loam, silt-loam and sandy-loam soils of a slightly acid to slightly alkaline nature, generally with a pH of 5.5 to 7.5 and on sites with full sun exposure. It has good tolerance to drought and seasonal flooding. 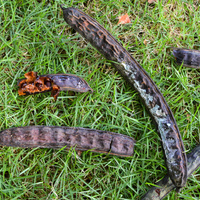 The seedpods are produced in abundance and fall to the ground over a wide area beneath the tree. Some are eaten by livestock and the seed carried with them, while the seed in those that remain germinate readily, sometimes leading to the forming of dense thickets. It is recorded as a weed in more than one reference publication, including being classed as having escaped cultivation and as a weed of the natural environment in Australia. However, its assessment by the Hawaii Pacific Weed Risk Assessment project (HPWRA) has not found it to be a high weed risk for Hawaii. Trees in the wetter parts of its range develop large, expansive surface roots which can be invasive, potentially cracking surface concrete and building foundations. The fallen flowers and seedpods create a sticky litter. Burns, R.M. & Honkala, B.H. 1990, Silvics of North America (Volume 2) : Hardwoods, Agricultural Handbook 654, U.S. Department of Agriculture (USDA), Washington D.C.
Skolmen R.G. 2000, Some woods of Hawaii: properties and uses of 16 commercial species, University of Hawaii, Honolulu, (Resource Managment; RM-7), 33 p.